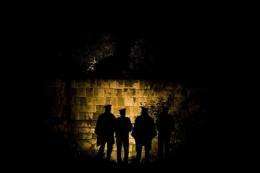 Police officers stand guard in Peru in 2010. The vigilante Internet hackers called Anonymous blocked the website of Peru's police who fight against computer crime, a officials said Monday. The vigilante Internet hackers called Anonymous blocked the website of Peru's police who fight against computer crime, a officials said Monday. The attack Sunday against the Division of Investigations of High-Tech Crimes "restricted access to the website from the outside," a police source told AFP on condition of anonymity. "If the police like to infiltrate us, maybe we can do the same," a message on the Anonymous Peru Facebook account said after the attack. "PNP (National Police of Peru) I'm watching you," the message said. Anonymous also published about 200 e-mail complaints of electronic fraud received daily by the the Peruvian police. In June 2011, the Peruvian police requested assistance from the FBI of the United States to locate pirates who disrupted at least eight government websites, such as the ministries of health, of energy, of the Coast Guard and of the National Penitentiary Institute. Twenty-five hackers suspected of links to Anonymous were arrested in February after cyber attacks in Argentina, Chile, Colombia and Spain, according to the international police organization Interpol.